That reminds me of being a kid. 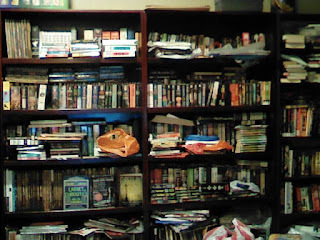 Our family had overflowing bookshelves. Looking at that picture, I can smell the old dusty books as if I were there now. I've always taken to buying 3-5 books every month whenever I see a booksale nearby. This has slowly taken up most of my shelf space within a span of a year. My full time job has taken away most of the time that I usually alot to reading. 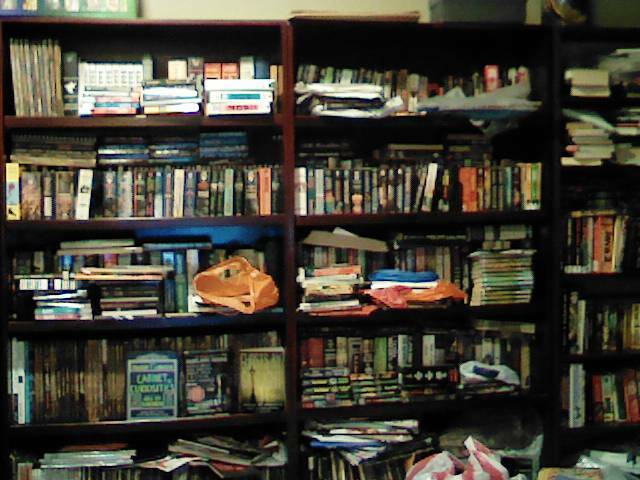 :( At the very worst, I will need to giveaway some of my books soon to make up space and losing a book no matter who the author is has always been a difficult process for myself. Nose cone filters. You can buy them on eBay, and they filter out dust and pollen! Just wear them whenever you go into your library. You got a nice bookshelf there sir. I'm in the process of collecting books again because half my collections are washed away by Ondoy. I also want to end up with someone who loves to read books...who wouldn't mind me having a large stack of them in the house and would probably clean the shelves for me when i get allergic to dusts too.